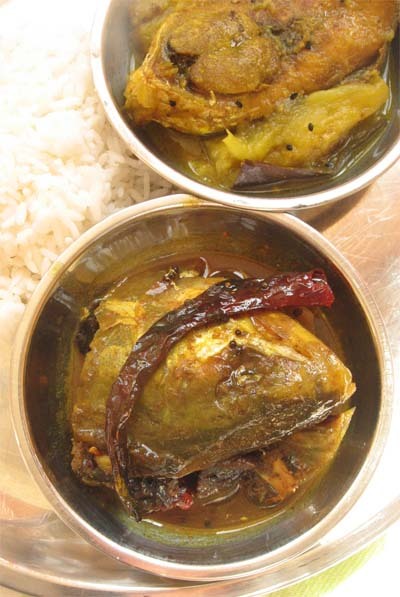 Amidst the umpteen other things that my Dida(maternal grandmother) cooked, there was an Ilish Maccher Tauk. Heads of ambrosial Ilish suspended in a thick, brown, sweet and syrupy liquid that was sweetened with jaggery and soured by ripe tamarind. To call it a "Hilsa Head Chutney" would be plain blasphemy. It was a backstage kinda dish. I mean while the choicest pieces of Ilish were fried and served as is in a bhaja, the beautiful steak pieces steamed as a bhapa in clinging mustard sauce with fluffed white rice, the fish roe were fried and served with the tel and fresh green chili, the head and the tail led a sad life in waiting. "Too many bones. Can't eat it", said the young girls in the family with a toss of freshly washed step-cut hair. "Not enough meat in these pieces", said the grown up men who thought it beneath themselves to be served a lyaja -- a fish tail. "Rohu heads are better. This has a strong smell", said the younger men, their faces till gentle, their opinion yet not chauvinistic. 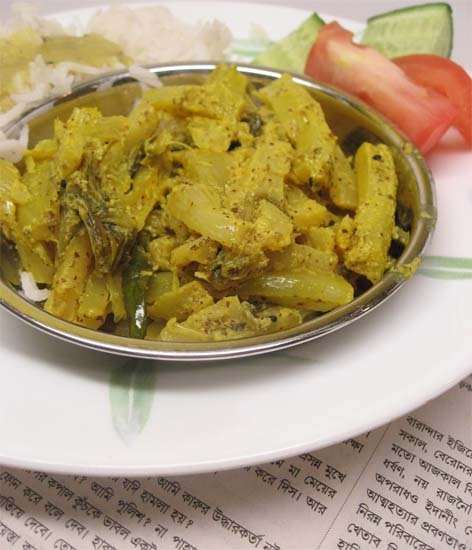 And so the matha and the lyaja -- the fish head and the fish tail -- waited in my Dida's kitchen till she was done with the bhaja, the jhaal, the jhol. By then the sun was high up, the crows sitting on the Neem tree outside the kitchen were tired of all the cawing, the neighborhood cat had a princely meal of Ilish fish scales and was patiently waiting by the kaltala for the remains from the men's lunch plates who could never chew on the fish bones. The kaajer mashi--the house help-- Minoti'r Ma was hovering around the back door waiting to see which piece she would be taking home. It was then that my Dida opened up a green lidded plastic jar where lay a block of tamarind, brown, ripe and sticky wrapped in a piece of Bartaman. The matha and the lyaja heaved relief. They loved the tauk. They loved being in that tangy, sweet liquid where they were the stars of the dish. Minoti'r Ma stopped fretting and came to sit by the stove. I kept telling Ma that I would have lunch later with Dida and the older women. Dida put the kadahi back on the unoon and poured some more Mustard Oil in it. Minoti'r Ma rubbed the tamarind in a bowl full of water to take out the seeds and make the "kaath". 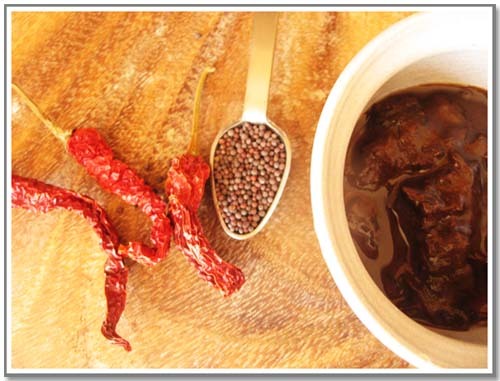 The water slowly turned a deep burnt sienna and the kadhai hissed with scarlet red chili and mustard seeds. The matha and lyaja nudged each other and smiled. Their moment had come. As they bubbled in the tamarind gravy of the tauk sweetened by jaggery I waited patiently for the last course of my meal. 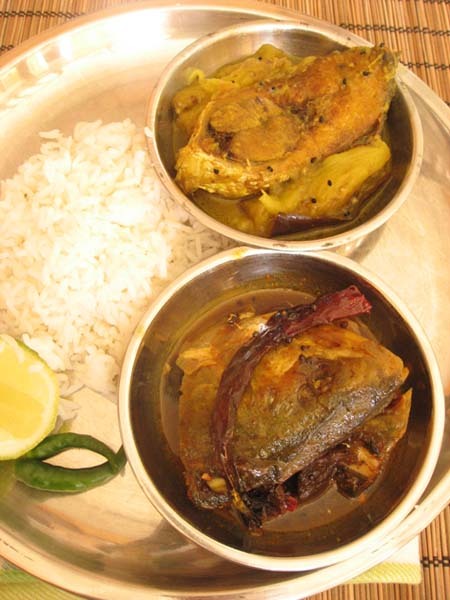 The Ilish maacher Matha'r tauk. My Mother made this tauk way back in March when she was visiting. I merely hovered around in anticipation. She and I are the only ones in the family who will eat this dish nowadays. 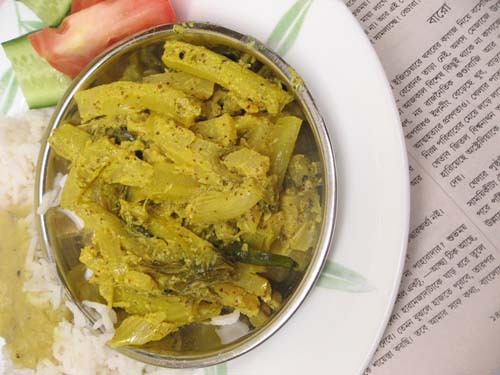 So I wait for her--to visit us---and amidst many other things to cook me a Ilish Maacher tauk. Clean head and tail piece of Hilsa. 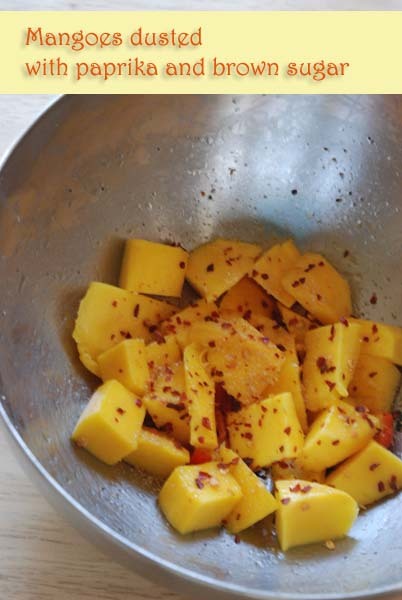 Rub with turmeric powder and salt and then keep aside for 15-20 mins. Fry head of Ilish till it is golden brown. Make about 2 tbsp of tamarind paste by soaking ripe tamarind in warm water and then rubbing to take the seeds out. This was a breakfast from last Sunday when it was sunny and bright. 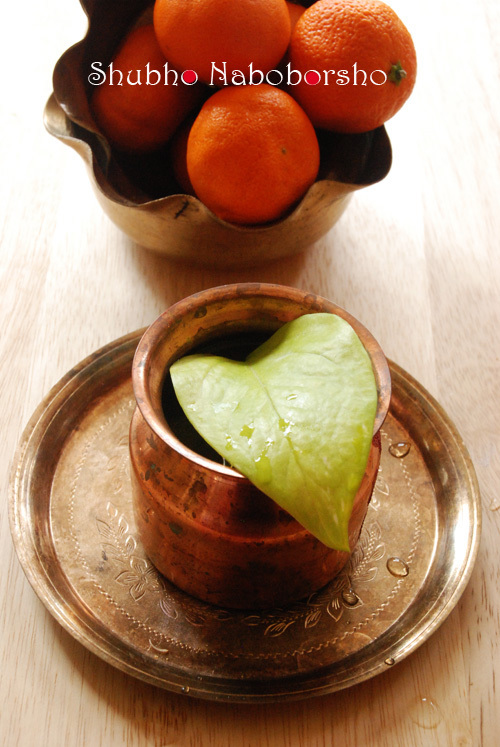 The radiant looking chutney powder is a treasured gift sent by my dear blogger friend Vani of Mysoorean. 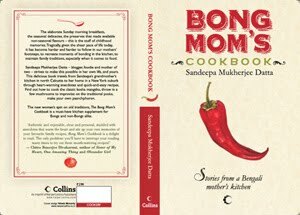 I had won a Giveaway at her blog for a Cookbook but when the large sized package arrived from her it contained lot more than the book. There was a sweet chutney powder which mixed with ghee and smeared on soft Idlis makes it divine, an authentic Sambhar powder which I have been using prolifically for sambhar and non-sambhars the last few weeks and a Bisibele Bhaath powder which I am saving for a rainy day. Thank you dear Vani for the spices and more. It is moments like this that make my hanging around here and telling the kids "Mommy is working" totally worthwhile. 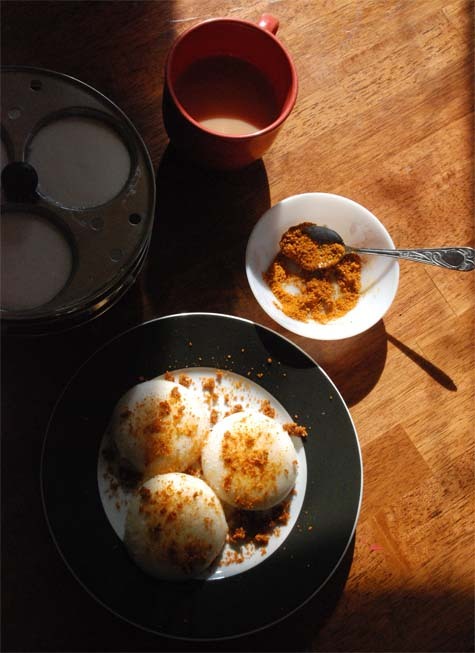 Oh and the Idli is made from a batter that my neighbor Aunty sent. I think I should come out clean and let you know that most days I do not cook elaborate meals. I have neither the time nor the energy for it. It also helps that I am kind of lazy. But then again I am a believer in home cooked food with a certain aura of health around it. Ask my friends, at times my healthy cooking spree drives them 56 miles away from my home. But I stick to it with the same earnestness that SRK has for his six-packs or Salman for his shirts. This, my earnestness, means I need to do some preps like cooking ahead or making masala pastes, baking fish instead of maacher jhol or serving a salad that gets done in the oven 90% of the time. Fridays becomes a tad challenging to eat an interesting dinner within my vegetarian boundaries. More so if I decide to not eat alu-posto, musurir dal and bhaat. Recently the bag of mini sweet peppers that I have been picking up from Costco or Wegmans have helped somewhat in that direction. 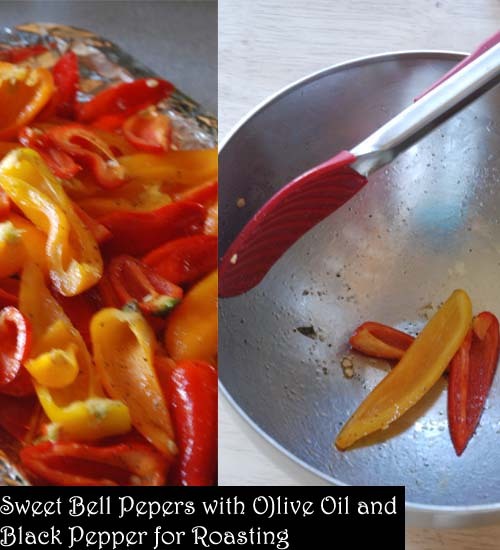 Roasted with a splash of olive oil and sprinkle of black pepper they taste divine. Some Feta drives it up a whole notch. 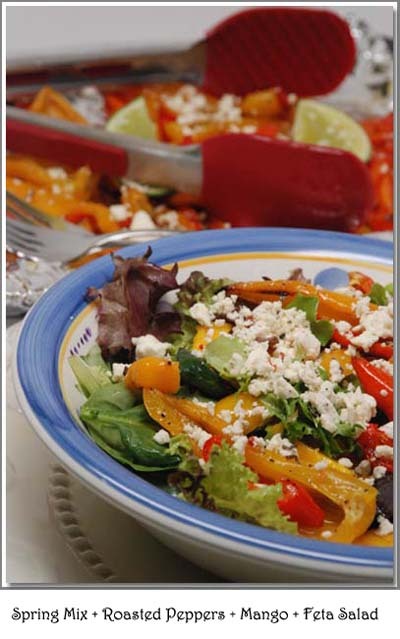 Today I made a salad with a boring box of spring mix, the roasted sweet pepper and some mangoes. It really, really was divine and I don't say such stuff often. The husband who on spotting a salad always asks "Ar ki ache?" (What else is there?) was almost happy to have just the salad and nothing else. Given that the sweet peppers roast themselves in the oven and the organic greens come right out of a box this is the kind of meals I love to cook. That way I get far more time to take pictures than actually cooking it. I got a batch of six mangoes yesterday but they were not really sweet. A sprinkle of brown sugar and some paprika made them eminently edible though. 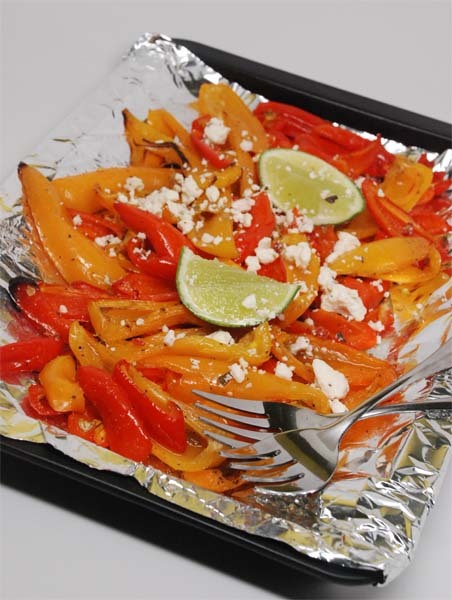 The peppers roasted in my toaster oven at 350F for 20-25 mins are delicious by themselves. Some feta and lime juice can only make it better. The final salad was as good as it was pretty.Try it out and am sure you will like it.Happy Friday Everyone. This post, the recipe part of it had been written way back when my Mom was here and whipping up such stuff. Then on another day when I was feeling kind of "over-the-top" senti, the prelude to the recipe was jotted down(which you will come upon on further scrolling down). Well I still feel that way but then today I simply had to write a little about LittleA---stuff totally unrealted to the recipe --- lest I forget and also to appreciate the funny side of her in a time when she is not letting me sleep through the night because of her allergies.You see this thing, the blog, is as much a sketchy weblog for me as it is a recipe archival process and 99.97% of the time the two pesky kids @ home are more important than a "Kopir Dantar Charchari-- a Cauliflower Stalk cooked in mustard paste". So any way in the past few months Big Sis and Li'l A discuss a lot about who was born when a certain event had occurred. "Well you weren't born the. R is older to you"
"Well No. You weren't even born then"
"Tahole ami koto din born chilam na (How long was I not born)?" she says in her loud-let's protest kinda voice. And then in a last moment attempt to gain ground and revel in victory of revenge she tells me "Were you even born when Didi went to XYZ school?" -- XYZ school being Didi's preschool and now hers. "Yes, yes, kintu tumi ki born chile (but were you even born then? )", Li'l A insists. Maybe what I am going to write next stems from the fact that I was indeed born a long time ago.Recently I have been feeling an urgency, a restlessness, a niggling feeling that time is moving away fast and I need to wrap my arms around it and fill my days learning to cook all the things that I would have never otherwise. And it does not involve a three layer chocolate cake. Nope. It is more of the mundane-ish stuff like the tel koi, my Mother's fulkopi'r dalna with no written recipe that can make it taste the same, my Dida's ilish maacher tauk which I can no longer learn from the one who made it best, my eldest Mashi's chicken curry cooked with fragrant leaves of the lime tree. It is not so much that I want to eat any of the stuff I mentioned. I am fine with the regular dal-chawal and baked fish for the moment. It is just that I want to know, like String theory, hoping that would solve all my problems, give me peace, make me say "Ha, so that is all it needs to make a tel-koi" and then let me go back to do what I usually love doing.Which largely translates to "Nothing". I just want to know the process involved, the ingredients chosen, the steps taken, the stories told and then store them away somewhere, neatly folded, waiting.That is all I want to do so that one fine morning if my heart so desires a Kopi'r Dantar Charchari, I need not panic. Instead I can take out the neatly folded recipe, smooth out the creases with a press of my fingers, read through it and heave a sigh of relief that nothing is lost.The assurance that they are there, like the atoms and the quarks and the fermions all a part of the Universe gives me a sense of peace. Okay, this might also be the side effect of finishing off half a bottle of Benadryl. One can never be sure. But this is a recent development I have noticed. 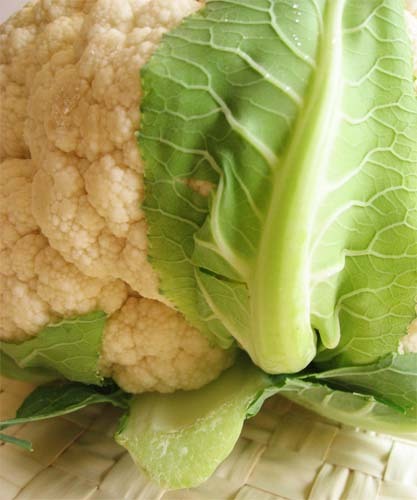 Otherwise I don't care a hoot about cauliflower stalks. This recipe that I have today is my Mother's and she is solely responsible for it. I never have enough patience to trim cauliflower stalks. One day I will. This recipe is for those days. For now this is how Ma made it. Save the stalks of a cauliflower. Trim the tougher sides and chop the inner in 2" long finger like thickness. Pressure cook the stalks. Do not add any water during this. Make a paste of 1 tsp of Mustard Powder in water. 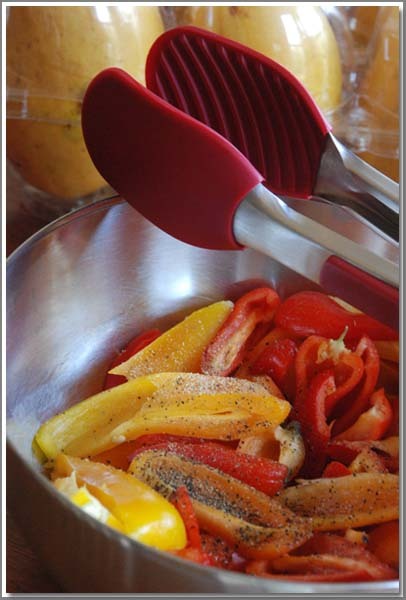 I have been using the Cookme Mustard a lot these days and it has made my life very simple. To it add about 1 tbsp of Kasundi. If you do not have kasundi increase the mustard paste. Next add the mustard+kasundi paste. Add salt to taste. Mix and cook for a couple more minutes. 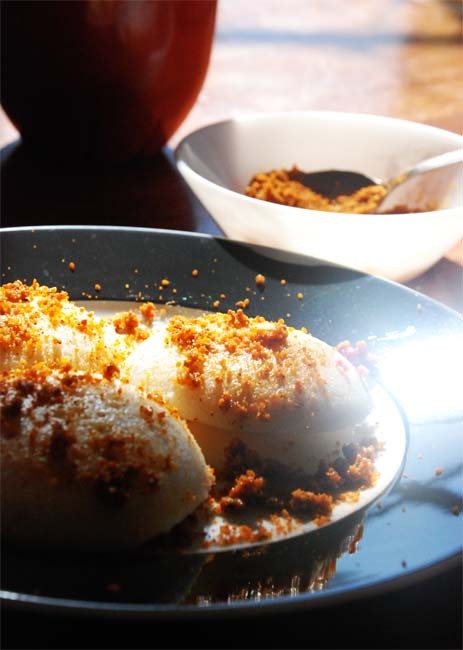 Some fried vadis crumbled on the top can add magic. Wishing you all a very Happy Bengali New Year. While in my last post I lamented on friendships lost, today I will sing paeans of the ones that sustained, with no effort of mine. And this past Spring weekend we got a chance to spend time with two of them -- T and R-da. We have known T for a long long time, so long that she is practically family. My daughters love her and her husband much, call her T pishi and draw her and R-pisho in family portraits. T is an awesome baker while her husband R-da is the bong food connoisseur and official Italian in my bong circle. I mean he is not an Italian but he has lived in Italy and makes the best pasta to my knowledge. Though we have had many meals at her home, this weekend we made a special request to eat only pasta, cooked by R-Da -- and yes a big "and" ---only vegetarian pasta-- no meat. When we reached their home on Friday evening their home was alive with Italian music which I had no clue existed and fragrant with a very Italian aroma which made my belly squeak and ask for "food". 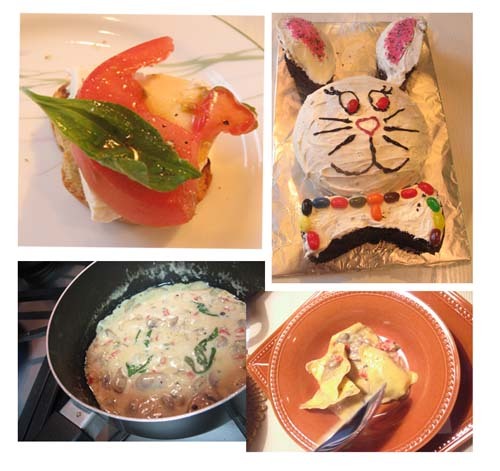 Before I could start eating though, the girls were waylaid by a lovely surprise, a cute easter bunny cake with pretty pink dust ears, baked by T. Naturally they, the girls, started off with a dessert. 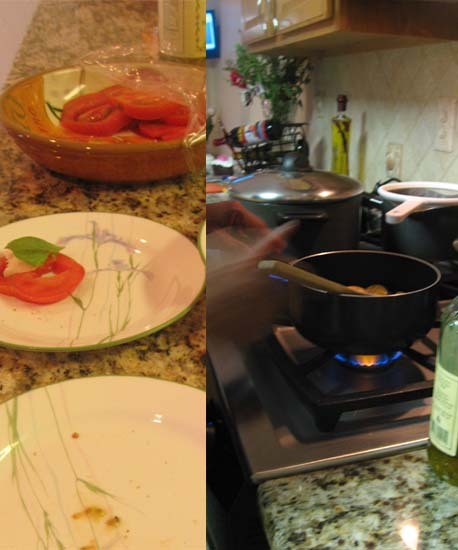 Next we started with an antipasti of caprese --fresh mozzarella with perfect tomatoes and fresh basil, and bruschetta -- bread rubbed with garlic and brushed with a very fragrant olive oil infused with black peppercorns. I had so much of it that it could have been my dinner. Then there were two Pasta dishes of Primo course and apparently no Secondi. Don't ask me "Whaat"? It sounded Greek to me but this is what T said was the order in Italian courses. I still remained clueless. In plain Bong speak for the main course there was pumpkin ravioli in white sauce. The white sauce, home made with mascarpone and what not was mind blowing. R-da also made a vegetable sauce and served it with tagliatelle. The sauce is supposed to be meat based but because of our veg requirements he made it with grated carrots etc. Okay, we did not even realize it was supposed to be meat based it was so good and that from a moderately meat loving Bong. With the second pasta they served an eggplant dish which again T kept harping on as "should be antipasto" and some such thing. It had exactly the same effect like saying to a Martian "Ilish er Jhol should be only served with rice at a sit down meal and after that you have to take a nap". For me Marinated Eggplants a la Ottolenghi -- was so delicious; the eggplants so soft and buttery; and so fragrant with herbs and a lovely Olive Oil that I could eat it straight from the bowl standing at the security clearance for AlItalia. I know I went overboard with "so" there but it was Oh so good. By the time the meal ended we were brimming with good food and a content heart. It was then that T brought out her Tiramisu. Now to be honest I have never been a fan of Tiramisu. 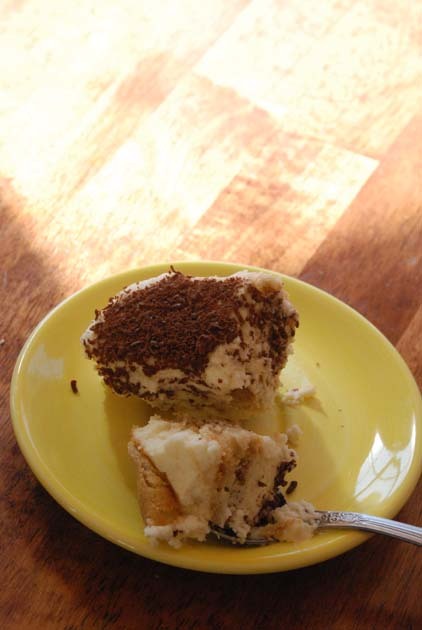 Or rather I have never had a Tiramisu that I fell in love with until the evening of 6th April, 2012. Mark your calendars. So I wasn't too excited and anyway I was full with the excellent pasta and therefore opted for a small piece. And then it happened. Shining lights, pushpa brishti and all that. That was the day all the loser Tiramisu's in my life were banished away by the prince, the real one, the chosen perfect Tiramisu. Now since I can never ever do justice to such a thing, I asked T for the recipe--which she finally gave after umpteen e-mails-- to be shared here. Okay she wrote it while on conf calls so you have to give it to her. If you are brave enough, go try it. I will just drive over an hour and reach her place and have the real thing. Thank you or Grazie Tanto. And we have to go back soon because Li'l A was mighty displeased to come back home and said she wants to stay at T Pishi's home for s-i-x-t-y days. "Sixty days thakbo", she shouted. "Sunday, Monday, Tuesday, Wednesday, Thursday --s-i-x-t-y". Good luck kiddo, let me see which college gives you an admit. 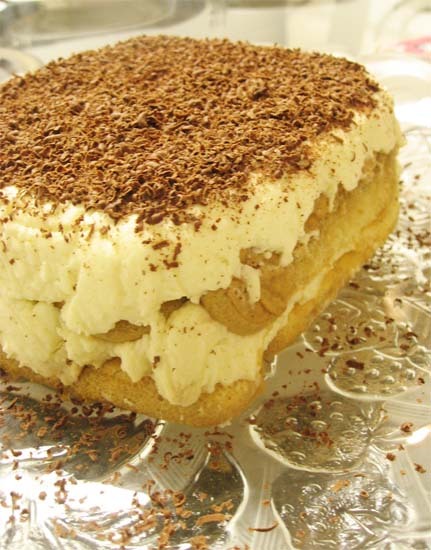 Till then let's eat some Tiramisu. PS: Pardon the picture qualities, I was so involved in eating that spent minimum time taking pictures and that too in night light. My exact recipe is not electronically available. So for "faaast" I am sending this from internet, which comes close to my recipe, and I modified it a bit to make it closer to my recipe. 1. Whip cream and 3 TBS sugar to almost stiff peaks. Set aside. 2. Mix mascarpone cheese with 1 TBS Kahlua, vanilla. Whisk together. 3. Fold mascarpone mixture with the sweetened whipped cream. 4. Combine coffee plus a bit of Kahlua...to taste. 5. Dip savoiardi biscuits in coffee mixture and place in pan in a flat layer. 6. Add a portion of the mascarpone cream mixture and level out. Repeat layer once more or two more times if doing a 3 layer cake. You can sprinkle some cocoa/shaved chocolate between teh layers, if you like. 7. Spread shaved chocolate on top for decoration.